Here is the list of the hotels near Juvigné. Book your hotel near Juvigné today, Tuesday 14 May for the best price, reservation and cancellation free of charge thanks to our partner Booking.com, leader in on-line hotels reservation. Below here is the list the 50 closest hotels of Juvigné, sortable according your criteria. You will find the position of these accommodations on the Juvigne hotels map. Hotel Andouillé Preferred hotel ! Au Pigeon Blanc is located in the small village of Andouillé, 14 km from Laval. The hotel offers a traditional restaurant and heated rooms with a 80-cm LED TV with cable channels and free Wi-Fi access. The rooms at Au Pigeon Blanc have parquet flooring and a wardrobe. The private bathroom includes free toiletries. A continental breakfast is served every morning in the dining room. The property can provide pre-prepared meals upon prior request for guests to enjoy dinner in the privacy of their room. 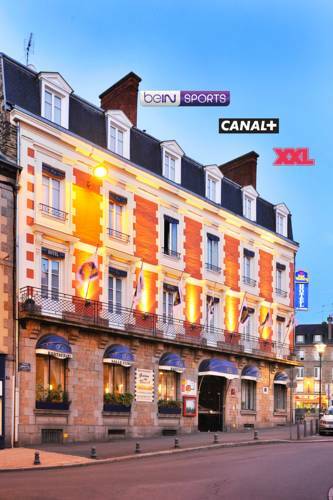 Provided with a garage for motorbikes, the hotel is situated 20 km from the city of Mayenne and a 20-minute drive from Laval Golf. Laval Train Station is 17 km away. Below here is the hotels map of Juvigné. Names and details of Juvigné hotels can be shown on the map clicking on the prices icons.